The Chess Lv.100 is a free Windows 8 Chess Game app, and with this chess game app you can enjoy playing Chess right on your Windows 8 PC. As everyone knows, chess is a classic strategy board game, which is played between two players. It has been one of the world’s most popular games from ages and probably will remain forever. Millions of people play this game at home, clubs, online, and in tournaments. The objective of the game is to defend your king anyhow and defeat the opponent’s king through “Checkmate”! If you love strategy games, and want to check your excellence in strategy making and in tactics, then this Windows 8 Chess game app is a must try one. You can get this free Windows 8 Chess game under the Games category in Windows Store. This version of chess game is already popular among the Windows 8 users, but if in case you won’t find it, then you can use the Windows 8 Search Charm (Win + Q) or the link given at the end to get the game. The most basic prerequisite of the game app is, you must know how to play chess. As there’s no tutorial or help file present within the app that can tell you how to play chess. You can start playing chess by simply clicking the app’s tile in the Start screen. You can play either Vs. Computer, or Vs. Human. This Windows 8 chess game app has got its name as The Chess Lv.100 because, the game has 100 levels to play in Vs. Computer mode . Level 1 is extremely easy and level 100 is extremely difficult. As the levels increases, the computer opponent becomes more powerful and hard to defeat. You have to challenge and defeat the computer to earn medals! In Vs. Human mode, these levels are disabled. 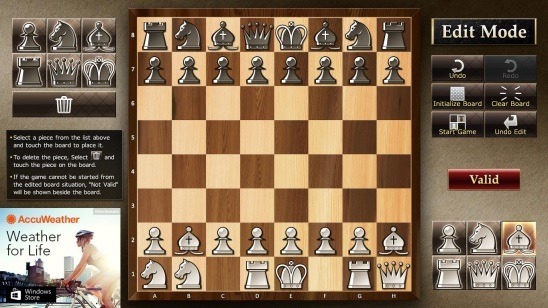 I really had a fun time playing Chess within this free Windows 8 chess game app. The game works without any issues. The moves animation is pretty smooth and the graphics are very well made. The rules of chess, all apply in the same way here. It is basically a straight chess game app for windows 8. The best thing about this Windows 8 chess game app is it gives you lot of customization options. One way to open the settings is to click on New Game button. These settings are basically those settings which applies before starting a game. 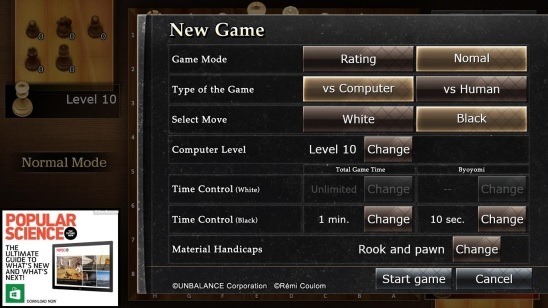 The settings included are: Game Mode, Type of game, Select Move, Computer Level, Time Control, and Material Handicaps. Game Mode contains two options: Normal and Rating. In normal mode you can undo a move, interrupt a game, and get hints. While in Rating you can’t undo, interrupt, or get hints. Type of game includes two options: vs Computer and vs Human. Select move lets you choose the colors of your chess pieces. Computer level option contains the 100 levels of difficulties. Time control option is a feature which puts a time limit, and if you won’t make a move within the time limit then you’ll lose the game. 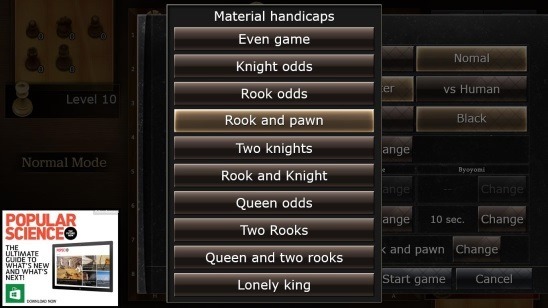 Material Handicaps option will make the game uneven, that is one of the player will start with missing pieces. The gameplay is pretty good. If you are feeling bored then, you can end the game anytime, by clicking on the Resign button. 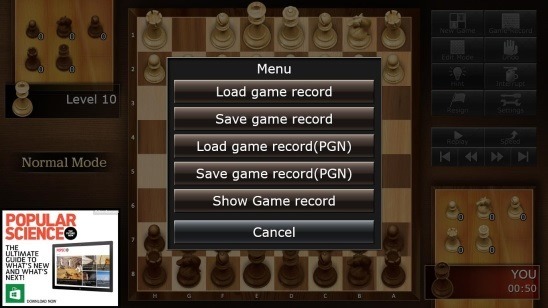 Another good feature of this Windows 8 chess game app is you can save the game in-between and resume it anytime by reloading that particular saved game record. You can do this by clicking on the Game Record button present on the main screen (the only screen of the app). I also liked the Replay feature of the app, which plays all the moves that have been played during the whole gameplay. Apart from that, the game app also gives you the ability to create your own custom game by rearranging the pieces on the chessboard before starting the game. The above is a screenshot of creating custom game using the Edit Mode button. Decent Windows 8 Chess game app. Options to play against computer or human. 100 adjustable levels of difficulty. Multiple options and settings to make the game interesting. Save and reload game records. Option to customize the game. Also check out these Windows 8 chess game apps: Chess By Post and Chess4All. The Chess Lv.100 is a pretty good Windows 8 Chess game app. It’s simple and fun. 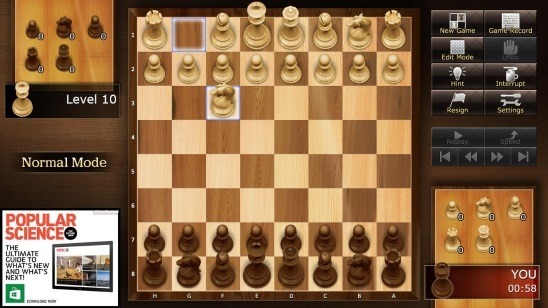 The features makes it a good game app to play chess against computer or your buddies and test your strategic skills. Above all, it’s all for free. You might also like this free Windows 8 detective game app. Get The Chess Lv.100 here.